Dedicated selection commands let you select by object properties. Click an object to select it. Click away from the objects to deselect. Drag a selection rectangle from left to right to use a window selection. Note: When you make a window selection, objects completely enclosed in the selection rectangle are selected. Drag a selection rectangle from right to left to do a crossing selection. ● When you make a crossing selection, all objects inside or partially inside the selection rectangle are selected. ● To make the mouse always use either a window or crossing selection, see Mouse Options, Mouse group select. Press and hold Shift while clicking single objects or using a window or crossing. Press and hold Ctrl while clicking single objects or using a window or crossing. If several objects appear to be stacked in the area of the cursor and Rhino is not able to tell which one you want to select, the Selection Menu appears. When the Selection Menu pops up, the current object and its designation in the list highlight. Click the desired object name in the selection menu list with the left mouse button. Click the left mouse button at the original pick point to cycle through the object name list. Click the right mouse button to accept the currently-highlighted object name. 1. Use the mouse wheel to cycle through the list. 2. Click the right mouse button to accept the currently-highlighted object name. Click away from the objects. Note: To configure the selection menu, see: Selection Menu Options, or right-click the Selection Menu title bar. You can select sub-objects with a mouse before a command starts (pre-select) or during a command (post-select). Press and hold Ctrl + Shift and left mouse click, window, or crossing. Press and hold Ctrl and left mouse click, window, or crossing. Command-line selection filters work on a more limited set of sub-objects for commands that ask you to select objects after the command starts (post-select). These commands let you use filters to pick a sub-part of an object rather than the whole object. Note: Sub-object parts can be selected and de-selected using capture tools: SelWindow and SelCrossing, Lasso, SelBrush, SelCircular, SelBoundary, SelVolumeSphere, and SelBox. The Selection Filter restricts any selection mode (SelWindow, SelCrossing, SelAll, etc.) to specified object types. ● The selection filter works for pre-selecting sub-parts of objects using Ctrl + Shift + Left-mouse click. ● Sub-object pre-select honors Selection Filter settings. This only affects polysurface face and edge selection. Since edges are essentially curves, and polysurface faces are surfaces, if you clear the Curves check box, edges won't select when you hold Ctrl + Shift and click. If you clear the Surfaces check box, polysurface faces won't select. 1. Set the filter to Points. 2. Use the SelColor command to select red objects. Only red points will be selected. 1. Set the filter to Curves. Only curves within the window will be selected. 1. Set the filter to Surfaces. Only curves will be selected for one selection. The filter then returns to its previous mode. Right-click the desired filter check box. Right-click the desired filter check box again. Restricts the selection to point objects. Restricts the selection to mesh objects. Restricts the selection to curve and surface control points. Restricts the selection to curve objects. Restricts the selection to Dimensions, Leaders, Dots, and Text. Restricts selection to point cloud objects. Restricts selection to surface objects. Restricts selection to light objects. Restricts selection to hatch objects. Restricts selection to polysurface objects. Restricts selection to block instances. Control cagesBox-shaped three-dimensional control point grid object, created with Cage command. It is used as a morph control object in CageEdit. Morph control objectsObjects that have been selected as a control object in CageEdit. It can be a cage object, a curve, or a surface. A morph control object controls the shape of the associated captive objects, and can be selected with SelControls command. Use the status bar Filter pane. The SelectionFilter command opens the Selection Filter control. You can restrict selection to one or more of the filtered types for one selection only. For example, this lets you select only curves or only hatches and blocks for the next single click, window, crossing or any other selection operation. 1. Press Ctrl and hover over the Selection Filter control. The check boxes clear and change to buttons. 2. Click the buttons for the object types you want to select. ● The command determines that the objects can be used and proceeds without further prompting. ● The command may proceed, but the result may be unexpected. ● The command cannot determine which objects are to be used and the pre-selected objects are unselected, and you are prompted to select specific objects again. ● Options may not appear at the command prompt. The Select command selects objects. The SelAll command selects all objects. The SelNone command deselects all objects. Note: SelNone does not run inside a command to clear pre-selected objects. The SelCrossing command selects with a crossing window. Drag a selection rectangle enclosing or crossing objects. The SelWindow command selects with an enclosing window. Drag a selection rectangle enclosing objects. The Invert command deselects all selected objects and selects all visible objects that were not previously selected. The SelBadObjects command selects all objects that do not pass Check. Note: Delete or rebuild the object. The SelVisible command selects all surfaces or meshes that are in front of other objects in the active viewport with a crossing selection. Note: In the video, using SelVisible in the Top viewport selects the green spheres and the plane. The SelSmall command selects all objects smaller than the specified size. The Lasso command selects objects by sketching an irregular shape around them. The lasso uses the Tracking lines color set in Color Options. ● Objects outside the viewport boundaries but within the boundaries of the selection object can be selected. ● The view can be panned during the selection to bring more objects into view. ● Use the CullControlPolygon command to hide control points behind objects. The SelBoundary command selects objects based on a boundary defined by an existing closed curve. Selects objects completely covered by the selection object or brush stroke. Selects objects crossed by the selection object or brush stroke. Selects objects completely outside the selection object or brush stroke. Selects objects outside and crossed by selection object or brush stroke. If Yes, the selection wire boundary is used as the boundary. With the Yes option, the testing is done in double precision floating point in screen space. If any part of the object is even slightly outside the selection boundary, it will not be included. If No, a selection mask bitmap is built from the boundary, and the objects are tested against that mask. With the No option, the testing is done using a bitmap selection mask, which effectively adds an average of half a pixel wide fuzz zone around the selection boundary. Objects that visually seem as though they should be included, but are actually partially outside the boundary, are still included. The SelBrush command selects objects based on painting a thick brush stroke. Click and drag or click repeatedly to draw the stroke. By default it uses crossing select: objects touched by the stroke are selected. Select an existing curve that represents the brush stroke. Specifies the brush width in pixels. The SelBrushPoints command selects points and control points with brush stroke. The SelCircular command draws a circle to select objects. The SelBox commands selects objects with point samples inside/outside/crossing a box-shaped volume. It will not select objects that should not be included, but may miss an object if the point samples miss the selection box. The SelVolumePipe command selects objects inside, outside, or crossing a pipe-shaped volume. The SelVolumeSphere command selects objects inside, outside, or crossing a spherical volume. The SelDim command selects all dimensions. The SelDimStyle command selects dimension objects based on their dimension style. The SelDot command selects all annotation dots. The SelLeader command selects all leaders. The SelText command selects all text. The AddNextU command adds the control point in the positive u-direction to the selection. The AddNextV command adds the control point in the positive v-direction to the selection. The AddPrevU command adds the control point in the negative u-direction to the selection. The AddPrevV command adds the control point in the negative v-direction to the selection. The NextU command selects the control point in the positive u-direction. The NextV command selects the control point in the positive v-direction. The PrevU command selects the control point in the negative u-direction. The PrevV command selects the control point in the negative v-direction. The SelConnected command selects adjacent control points. The SelU command selects all control points in the u-direction. The SelUV command selects all control points in the u- and v- directions. The SelV command selects all control points in the v-direction. The SelClippingPlane command selects all clipping planes. The SelExtrusion command selects all objects created as light-weight extrusions. The SelHatch command selects hatch objects. The SelLight command selects all lights. The SelMappingWidget command selects all texture mapping widgets. The SelNamedViewWidget command selects all named view widget objects. The SelPictureFrame command selects all objects created with the PictureFrame command. The SelCrv command selects all curves. The SelShortCrv command selects all curves less than a specified length. The SelOpenCrv command selects all open curves. The SelClosedCrv command selects all closed curves. The SelChain command selects curve or surface edges that touch end-to-end. The SelLine command selects all lines and straight, higher degree curves. For example, a straight degree three curve with four points will be selected, but a degree three curve with five or more points will not be selected. The SelPolyline command selects all polylines. The SelClosedMesh command selects all closed mesh objects. The SelMesh command selects all mesh objects. The SelNakedMeshEdgePt command selects unwelded vertices on polygon mesh edges. ● Polygon mesh vertices are not completely surrounded by faces are displayed. ● Joined meshes, such as those made by the MeshBox command, have naked mesh edge points where the sub-meshes are joined. ● To eliminate naked mesh edge points, match them in pairs, and then use the Weld command to make a single mesh that cannot be exploded. Edges that formerly rendered sharp will shade rounded, unless you use the FlatShade command. 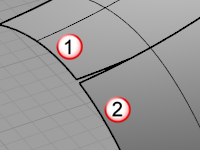 The IncludeUnweldedEdges option determines whether points on edges that are unjoined or only naked edge vertices will be included. This is good for troubleshooting MatchMeshEdge. The SelOpenMesh command selects all open mesh objects. The InvertPt command deselects all selected control or edit points and selects all visible control or edit points that were not previously selected. The SelPt command selects all point objects. The SelPtCloud command selects all point cloud objects. The SelPolysrf command selects all polysurfaces. The SelClosedPolysrf command selects all closed polysurfaces. The SelOpenPolysrf command selects all open polysurfaces. The SelNonManifold command selects non-manifold polysurface objects. The SelSrf command selects all surfaces. The SelClosedSrf command select all closed surfaces. The SelOpenSrf command selects all open surfaces. The SelTrimmedSrf command selects all trimmed surfaces. The SelUntrimmedSrf command selects all untrimmed surfaces. The SelColor command selects all objects of a specified color. Objects enclosed in block instances or groups are not selected. Select a color from the Select Color dialog box. Select color using red, green, blue values. The SelID command selects objects by object ID number. The SelLinetype command selects objects with the specified linetype. The SelMaterialName command selects objects with the same render material name assigned by object or by layer. Click Select in the dialog box to select an object with the material assigned. The SelName command selects object by name. Choose from the list or click Select to select an object with the target name. Note: Objects on hidden or locked layers cannot be selected with SelName. The SelRenderColor command selects objects by their (diffuse) render color. Objects enclosed in block instances are not selected. Objects enclosed in groups are selected. The SelBlockInstance command selects all block instances. The SelBlockInstanceNamed command selects all block instances of a specified name. The SelLayer command selects all objects on a layer. Click Select in the dialog box to select an object on the layer. Note: When using the script version -SelLayer, separate sublayer names from parent names with double colons (::) in the form <ParentLayer>::<Sublayer>. If the layer names contain spaces, surround the names with quote marks. Allows selecting an object in the model to specify the layer. The SelLayerNumber command selects objects by layer number. ● The number of the first layer is zero. ● Each layer has a number that is assigned to it for a Rhino editing session. ● The numbers may change when the model is closed and then reopened. ● This number has nothing to do with the order the layers appear in the layer dialog box. ● Deleted layers keep their number. The SelCaptives command selects captive objects set up using the CageEdit command. The SelControls command selects cage control objects set up using the CageEdit command. The SelObjectsWithHistory command selects objects that have history. The SelChildren command selects child objects of the currently selected objects. If no objects are selected, the All option will select all child objects. The SelParents command selects parent objects of the currently selected objects. If no objects are selected, the All option will select all parent objects. The SelLast command selects the last changed objects, including importing objects. Type a hyphen in front of the command name: -SelLast. Deselect currently selected objects before selecting the last changed objects. The SelPrev command re-selects the previous selection set. Type a hyphen in front of the command name: -SelPrev. Deselect currently selected objects before selecting the previous objects. The SelDup command selects objects that are geometrically identical with another object, visible, and in the same location regardless of other object properties. The SelDupAll command selects all visible objects that are geometrically identical, including the original. Since this command selects both the copies and the originals, it lets you find objects that have been changed by comparing a before and after version of the model. Compare to the SelDup command, which selects all visible objects that are geometrically identical, excluding the original.